The injection speed relative to injection pressure shows a U-curve. If the injection speed is too low, heat loss will be greater than heat generation, causing flow temperature to drop, viscosity to increase and solidification layer to thicken. So, resistance to flow, as well as injection pressure will rise. 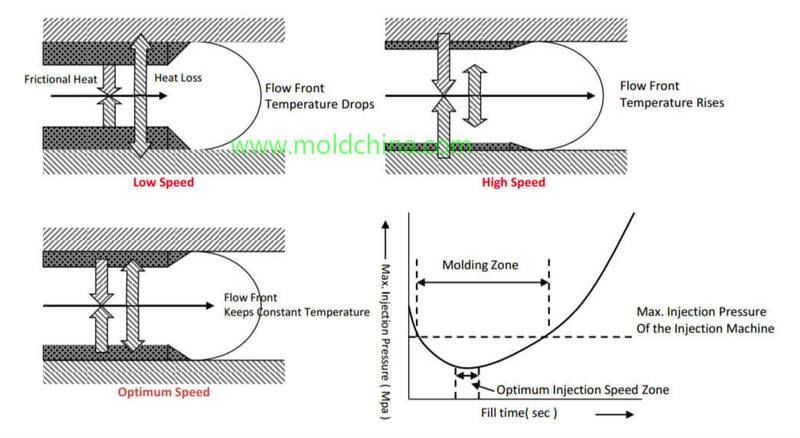 On the other hand, when the injection molding speed is high, flow temperature will rise, viscosity will decrease and the solidification layer will be thinner. However, the friction between the solidification layer and the flow layer will see a considerable increase, thus causing the injection pressure to rise. Injection pressure will be minimized when the flow speed is constant in the cavity.